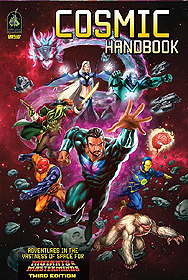 The Cosmic Handbook is a sourcebook of star-spanning heroic action and adventure for the Mutants & Masterminds Superhero Roleplaying Game. This book provides everything you need to take your Mutants & Masterminds game into the far reaches of outer space! Tips and examples to help create space-faring heroes and universe-destroying villains for your cosmic-themed series. Information on creating your own interstellar series, including new optional rules, suggested power levels, plot ideas, villains, and how to put it all together to create a truly cosmic story. Updated information on the Earth-Prime Universe - including new, super-powerful galactic organizations like the power-hungry Blackguard, the nanomorphs known as Argents, and the expansive Stellar Imperium ruled by the Star-Khan. Dozens of hero, villain, minion, and alien archetypes with variations on each, including the Cosmic Critter, the Space Demigod, the Avatar of Destruction, and the Galactic Tough Guy. Take your heroics from the streets and skies of Earth to the strange vistas of alien worlds and the star-filled expanse of deep space with the Cosmic Handbook!